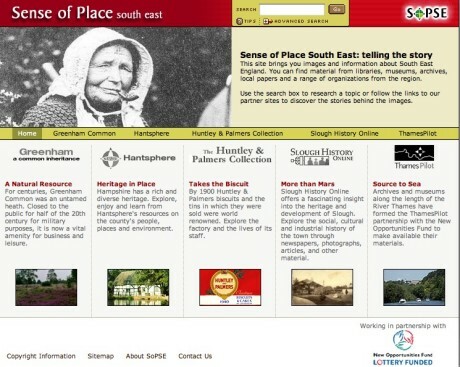 We supplied the content management system and web portal for the Sense of Place South East (SoPSE) project. This portal offers a number of microsites covering sites and locations in the South East region. Currently this includes 'Greenham - a common inheritance', 'Hantsphere', 'Slough History online', 'The Huntley and Palmers Collection' and 'ThamesPilot'. Each microsite delivers narrative stories enhanced with fully searchable images and further information from libraries, museums, archives, local papers and a range of organisations. The SoPSE consortium includes county council and local authority museums, libraries and archive services, each using the CMS and common narrative tools to create its own materials for its own microsite. For ThamesPilot, which brings together many museums and libraries situated along the river Thames (co-ordinated by the Royal Borough of Windsor and Maidenhead), we developed new interactive functionality for enabling visitors to navigate through the rich history of the River Thames from source to sea. Particularly popular is the riverside pubs tour. Archives and museums along the length of the River Thames made images and documents freely available from their collections. Illumina delivered the interactive designs for the website. SoPSE was funded by the New Opportunities Fund.